Before we start reading data from files, let us take a quick look at the different types of delimiters we have to deal with while reading or importing data. In general, it is a good practice to take a quick look at as you will clearly know the delimiter used in the file. Let us begin by reading data from a csv file using read_csv(). When you read data using readr, it will display the data type detected for each column/variable in the data set. If you want to check the data types before reading the data, use spec_csv(). We will learn to specify the column types in the next section. In some cases, files do not include column names or headers. If we do not indicate the absence of column names, readr will treat the first row from the data as the column name. Like we said before, it is a good practice to take a quick look at the data to check for the presence/absence of column names. We will first read the data set without indicating the presence or absence of column names. As you can see, in the absence of column names, readr has converted the first row of the data into the column names. As a result, the data is not read properly and there are lots of missing values and warnings. If the column names are absent (i.e. the column names are provided in a separate file), use the col_names argument and set it to FALSE. Now readr will not convert the first row of data into column name and instead it will generate new column names. We may not always want to use the column names generated by readr and instead specify new column names. In such cases, we can use col_names to supply column names as shown in the below example. Let us reread hsb3 and specify column names. The data will appear after/below such text/information. While reading data from such files, we need to skip all the rows where the text is present. If we do not skip them, readr will consider them as part of the data. Let us read the data without skipping any lines/rows and observe the result. ## Warning: 201 parsing failures. ## See problems(...) for more details. ##  1 # test scores of high school students. Use skip argument to indicate the number of lines/rows to be skipped while reading data from a file. For example, if the file has contents other than data in the first few lines, we need to skip them before reading the data. In the below example, we will skip the first 3 lines as they contain information about the data set which we do not need. Suppose the data file contains several thousands of rows of data and we do not want to read all of it. What can we do in such cases? readr allows us to specify the maximum number of rows to be read using the n_max argument. Suppose we want to read only 100 rows of data from a file, we can set n_max equal to 100. In the next example, we will read the first 120 rows from the hsb2 file. If you observe the last row in the output, it says # ... with 110 more rows, indicating that only 120 rows of data has been read from the file. Before you read data from a file, use spec_csv() to see the data types as determined by readr. If it determines the data types correctly, you can go ahead and read the data else we will have to specify the data types and we will have to do that for all the columns we want to read and not just for those columns whose data type was wrongly determined by readr. While specifying the data types we also need to specify the categories of the categorical/qualitative variable. To do that, we use the levels argument within col_factor(). Let us read data from the hsb2.csv file to understand data type specification. What if I want to skip a few columns? What if I want to read certain columns only? For the first scenario, we can use col_skip() i.e. instead of specifying the data type, we indicate to readr to skip that particular column while reading the data. 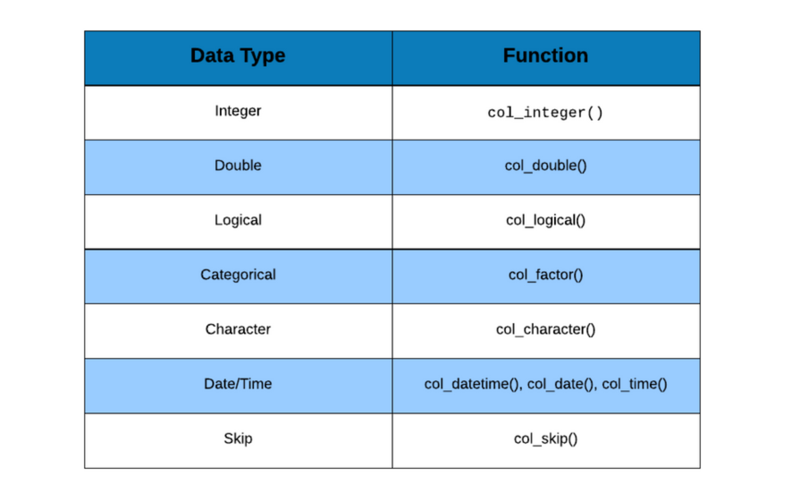 If you have a data set with 10 columns and plan to skip only a couple of columns, use col_skip() instead if you plan to read only a couple of columns, use cols_only().